Tottenhilll is a small parish of 588 hectares, situated in the Nar Valley in the west of Norfolk. The parish is bisected by the A10 Lynn Road and dominated by the gravel extraction pits in the centre of the parish. The name ‘Tottenhill’ derives from the Old English for Totta’s hill. Prehistoric activity is known to be rare in the Fenlands, where large parts of the land were under water until drainage during the Roman and medieval periods. However the Fenland Survey noted one distinct site which displayed a concentration of prehistoric pottery sherds, oyster shell and worked and burnt flint (NHER 23238). This, combined with the fact that it is situated close by a spring, is thought to indicate occupation on this site. Possible Neolithic of Bronze Age activity is seen near to the present day Tottenhilll village. A cropmark of a possible ring ditch has been recorded here, in conjunction with the discovery of a Neolithic polished axe (NHER 16232). Other prehistoric objects comprise a small number recovered in the 19th and early 20th centuries, often in association with gravel extraction. These include Palaeolithic handaxes (NHER 2267, 2268 and 22702), possible Early Bronze Age axeheads (NHER 2270 and 2271), as well as flakes (NHER 23065, 23202 and 23596). Although the Fenland Fieldwalking Survey did not recovered any Roman material, records from 1908 note the presence of Roman finds possibly indicating salt working (NHER 2266), as well as Iron Age/Roman pottery sherds and the remains of a possible Roman kiln and inhumations (NHER 2268). 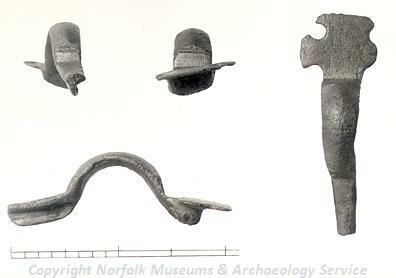 A small amount of metal detecting in the 21st century has also recovered an Iron Age or Roman brooch (NHER 14426), as well as pottery sherds, a furniture fitting, finger ring and brooch (NHER 29697). Records of activity between 1890 and 1943 also suggest the presence of a possible Early Saxon cemetery (NHER 2266), where over forty cremation urns were recovered. Fieldwalking recovered no Saxon material, but metal detecting in 1993 found a Late Saxon Borre style disc brooch (NHER 30257). Tottenhill is referred to in the Domesday Book, but the entry is short and the area is ascribed little value. The early medieval period, liked the Saxon and to a certain extent the Roman periods, is difficult to understand. However, it is thought likely that there was a church in Tottenhill during the medieval period (NHER 25332), though where this was situated is unclear. The only other evidence of a medieval period monument can be seen in the earthworks of ridge and furrow (NHER 14426) near to Thieves Bridge. The Fenland Fieldwalking Survey recorded the presence of a number of general scatters of medieval pottery sherds (NHER 23039, 23201 and 23202), but very few concentrations (NHER 23064). However metal detecting has recovered a number of objects including a lead star ceiling decoration (NHER 19115), a vessel or strainer fragment (NHER 44110) and a harness mount and 15th century candlestick (NHER 50141). Despite the presence of two villages, Tottenhill and Tottenhill Row, there is very little evidence for post medieval activity. The site of Tottenhill post mill (NHER 2282), a windmill built in 1760, can still be seen, and the site of a post medieval brick kiln (NHER 36520) and a 19th century spa or school (NHER 17313) have been recorded. However, the only standing building of architectural note is The Grange (NHER 36196), an 18th century building which is thought to contain a number of fragments of monastic buildings from the Nar Valley. From more recent history, it should be noted that a World War One airfield is known to have existed here (NHER 13629), and that the Wormegay World War Two decoy airfield also covers part of this parish (NHER 32381).